Being the only shape chosen as a symbol for both a letter and a number. Not foreseeing the appeal of tossing horseshoes at a stick, before it could promote circular rings as the better alternative. And thus a game that could have been known as “Rings”, lost out to stupid equestrian footwear. Never, in all the time they spent together, expressing to Pythagoras its true feelings for him. Now you must choose between these two most excellent figures, to decide who should make it to the final round, where only one can be crowned, “The Greatest Shape.” Submit your vote below, or via email, to decide who wins this round. On Saturday the voting for this round will end, the winner will be announced, and Lens and Square will battle it out, in an attempt to reach the finals. Have you ever seen a triangular bubble? Triangles show you the way. Circles send you in a loop. Circle. HELLO! That bike I had with the triangle wheels made me homicidal. A triangle is like that girl in high school who dated you ONLY because she had low self esteem and lower expectations - then bitched about it all the time. I have to go with circle. It's the shape that just seems warm and giving. 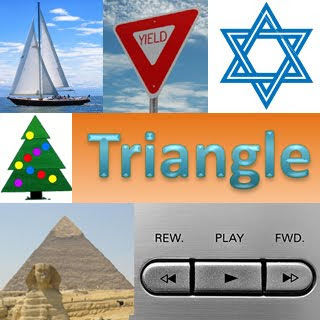 Triangle just seems self absorbed. can we combing the shapes and make a Triarcle? Doughnuts are my favorite fruit. Gotta be circle. The circle, totally. Come on! I’m voting for circle. The triangle is too menacing for me and the points are sharp and look like weapons. I love this fun battle! You’re too funny. Triangles i do have a place for 'cause of the star of david. But honestly, I gotta go with my man the circle. Totally circles win over triangles. I watched Triangle last night, so I feel compelled to side with it. Also triangles are the strongest shape for bracing things so yeah. Once you go triangle you never go biangle. This was a tough one. These two shapes were my picks in earlier rounds. I had to do a lot of actual thinking this time. In the end it came down to primative man. The circle was the forerunner of the wheel, this allowed primative man to move from place to place and his needs (food, shelter) dictated. Also a cool way to sit around the fire at night...everybody got to be equally close, promoting group harmony. Triangle for him was a shape used on the end of spears and arrow-head shaped stones...mainly for hunting. I have to go with circle, he is the clear winner. Besides, primative man could always club his food to death! I've been drawn to the more complex, challenged underdog type. I guess it's about time I realized that strategy keeps landung me with losers. Thus, I'm voting for the boring simpleton: the circle. No more stale donuts for this girl! I so love your writing style. You make me smile. 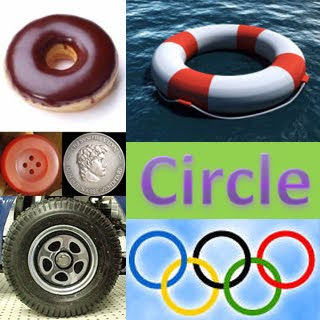 Now my leanings were to circles (the unbroken ring thing -- oh, and donuts!) but I think you cheated with the Star of David and Christmas trees. Now I am torn. I am going to go with circle but with reservation. Honestly, where would the Horror genre be without the obtuse angle?